Tuesday, September 22, 2015 was a sad day and a not so sad day. Tessa was my first Border Collie ever. Charlie and I had been married about 2 months and he had to go offshore for his very first trip offshore after we were married. Being on my own was no big deal, however it was a bit different being that I was in Scotland and knew next to no one. He was only gone for about five days that I recall but I got Tessa during that time. She was just 8 weeks old. My sister Jessica came to visit later on when Tessa was a bit more grown and gave her the middle name of Jane, and Tessa Jane she was forever after know as. 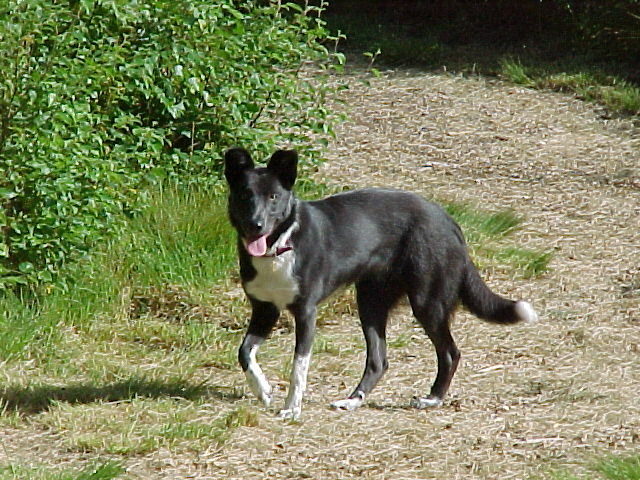 Tessa was a blue smooth border collie. She had blue eyes until she was about 5 months old when they finally settled to the darker color that they were the rest of her life. We never got our next border collie, Abbey, until Tessa was 18 months old. So she had Charlie and I all to herself for that time. Hector, Charlie’s Da, adored Tessa. He never really forgave us when we got Abbey our second border collie until we got our third border collie, Prue. Than it was not so much that he forgave us, but that he gave us for lost. Apparently we were crazy. Charlie never figured out why he was so stand offish with Abbey until he saw a photo of Teddy, Hector’s child hood Border collie. Abbey was the image of Hector’s Teddy. Abbey of course is an intelligent border collie so she eventually won Hector over by bonding with him watching Aberdeen and Celtic footie game. We had made a VCR tape for Abbey of bits of the game and bits of Animal Planet and she and Hector watched that tape for hours together. The TV would be off and Abbey would find Hector in the sitting room. She would go and sit pretty in front of the TV. Pause and wait. Turn and look at Hector. Turn and look at the TV and repeat until he turned on the TV and popped her tape in. Abbey trained Hector to turn on her tape and all was well between them. Tessa never did watch Footie with Hector and Abbey. She did have Hector wrapped around her paw equally but in a different area. Tessa was afraid of heights, specifically bridges and horribly so with bridges she could see through. When she stayed with Hector, they went for walks daily. Upon coming to a bridge in Buckie on their walk, Hector would pick her up and carry her across so her paws didn’t have to touch that scary old bridge at all. Charlie and I took Tessa frequently to Aden Park for walks and outings. Aden Park is a stunning location in Mintlaw, Scotland. She always enjoyed meeting new dogs and the bigger and stranger they were the more that she wanted to play with them. We walked at the beach in Peterhead, Scotland or down at the dunes frequently. Tessa never seemed to have much interest in small dogs, but those great big snarly boisterous tough dogs had her attention from first woof! Rolling in dead seagulls was another favorite pastime of hers as well as drinking the sea water in order to throw up all the way home in the car. You will be missed Tessa Jane. She had reached 15.75 years old. 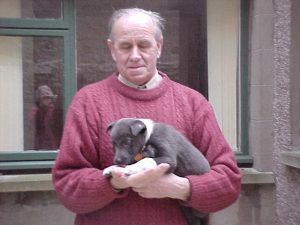 A ripe old age for a Scottish Border Collie. 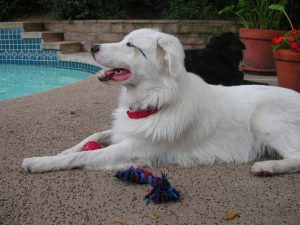 Domino was a double merle Australian Shepherd, Aussie. We adopted him in summer of 2006 but I first heard of him December 2005 where he had been dumped by his previous owner into a kill shelter in California. I called the shelter from Scotland and they said the owner stated Domino was 7.5 years old. 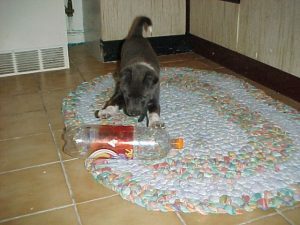 He was adopted and returned the next day and later adopted by an Aussie rescue agency. The agency foster homed him for about 6 months and we got him after moving back to the states summer of 2006. Domino was with our family for a little over 9 years. We know that he was probably at least 4 years old by the time that we got him but don’t know if he was really as old as 7.5 years. Either way, he wasn’t a spring chicken when we let him go. 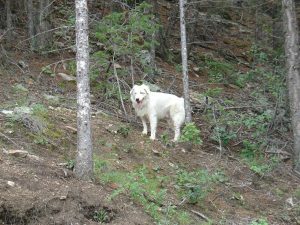 A double merle is a breeding that should never be done. It breeds a merle to another merle in the mistaken hope that they will get a litter of all merle pups. Usually this is done to try to get more money as Merle pups are in higher demand due to the public liking the color and pattern. The problem with this is that you don’t necessarily get more merle pups in the litter. You do have a 1 in 3 chance of getting a deaf pup that may also be blind and have a lot of other genetic mutations and abnormalities. Domino was mostly blind and he was deaf. Towards the end we had to do eye drops for him every day for over a year. One morning he had woke up with his blue eye all yellow orange because it was bleeding inside the eye and I couldn’t even see the blue any longer. Once we got the swelling down and the bleeding stopped after a few months, we did eye drops for maintenance to try to stop that every happening again. 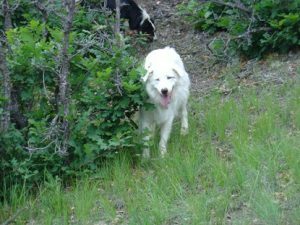 This was some of his genetic problems due to being a double merle. One of his eyes was smaller than the other, had very little color and was his mostly blind eye. Domino was all bull moose! His idea of fun and play was to run over the border collies and he loved a good tussle. He loved being outside as well as inside by the fire on a cold wintery day. Oddly enough, Domino and I didn’t get on as much as I had hoped. We did have an understanding and got on most times, but he decided from the off that he was Charlie’s dog. He loved Charlie through and through. He sat many times next to Charlie and would drape his front paw over Charlie’s hand and just rest it there. Or he draped his front paw over Charlie’s ankle if Charlie’s feet were up on the settee. He was happy and content to just sit there with his paw draped over Charlie as if he was holding hands and that was all that he required. Now if Charlie wanted to pet him, hold him tight in a death lock and love on him….who was Domino to ever say no. Domino and I had quiet moments where he draped his paw over me as well when we were alone. With no one around, I could give him a little treat and he took it from me ever so gentle. I was always amazed at how white he was in color and how soft his fur was…superbly soft. Many folks have bought some of Domino’s fiber to spin in their projects. Domino you are missed and now you are free from pain. Whatever age you were, you had a full and long life. I did say that we had two that left us Tuesday and one arrived. During the time that Charlie and I were letting Tessa and Domino go and burying them in the pet cemetery with our other dogs, we had a new arrival here on the ranch. 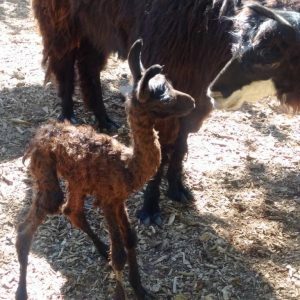 Glenda, our black llama mama, had an all black male cria. He is ever so long legged and scrawny looking. But look at all those curls stop those stilts for legs. Baby is doing well so far and up and moving around this weekend. Glenda seems to be settling into motherhood as this was her second cria. She lost her first cria in CO a few years ago due to a dog interference. We were unsure if she would bond with this baby after her last traumatic experience but she has done well. We still have a few llamas that we believe are pregnant but with no idea of their breeding date we won’t know when the crias will arrive until they are here. The first cria lived for 10 days and that all happened while Charlie was offshore. 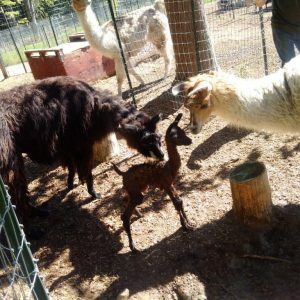 This is the first llama we have ever had born that Charlie was able to see. Two left and One arrived. What a surprise that made a very sad day just a little bit better.